Last week's very wet storm gave a big boost to lagging seasonal precipitation levels in the Bay Area and throughout Northern California. A rich stream of atmospheric moisture from near Hawaii dubbed the "Pineapple Express" delivered up to 8 inches of rain in some coastal areas and set a record for the density of water vapor measured in the air during the region's typical wet season, from October to April. Mount Tamalpais got a total of 7.40 inches of rain during the storm -- including 5.86 inches on Friday. Venado, the site of a rain gauge just west of Healdsburg in northern Sonoma County, recorded a storm total of 6.04 inches. 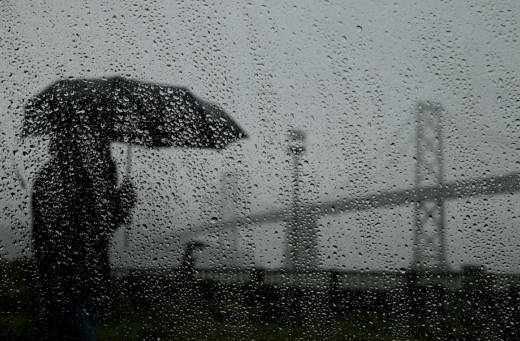 San Francisco got a total of 3.43 inches -- more than double the normal rainfall for the entire month of April (and more than city received during December and February combined -- two usually wet months that were bone dry this season). The 2.22 inches recorded Friday beat the previous April 6 record of 1.28 inches, set in 1871. Meteorologist Neil Lareau of San Jose State University said the blast of heavy precipitation -- which came on the heels of a wetter-than-usual March -- helped push the seasonal precipitation closer to normal levels. He said it's a surprising comeback to a season that just a few weeks ago resembled the worst of the region's recent drought years. "It was a stretch to make up for the deficit in January and February, so this is really a great turn of events," Lareau said. "And to do it without major flooding too, is always a good thing." One widely watched gauge of precipitation, the California Department of Water Resources' Northern Sierra Eight-Station Index, has reached 83 percent of its average for early April. The nearly century-old index reached its all-time high last year, measuring 182 percent of average. Because of last year's historic precipitation, nearly all of the state's big reservoirs have remained at or above their average levels -- despite the scanty rainfall earlier this season. Most Bay Area locations have recovered to somewhere between 60 and 75 percent of normal precipitation for this point in the season. Even after the big storm, though, the water content of California's mountain snowpack is still less than half its average for this time of year. The rain cut off abruptly Saturday morning, but not until it had caused minor flooding along the Truckee River below Lake Tahoe. And parts of Yosemite Valley were closed over the weekend as rain and rapid snowmelt triggered a rapid rise on the Merced River. Elsewhere in Northern California, state officials warned as the storm approached that a spike in runoff might necessitate use of the partially rebuilt spillway at Oroville Dam for the first time since repairs began on the badly damaged structure last summer. On Sunday, however, the Department of Water Resources said use of the spillway is now "unlikely." Weather models suggest Northern California is in for at least a week more of unsettled, potentially wet weather, with two relatively weak storms expected by the end of the work week. This report contains reporting from The Associated Press.